Rarely, okay, never have I read a book which is so simultaneously abhorrent and appealing. 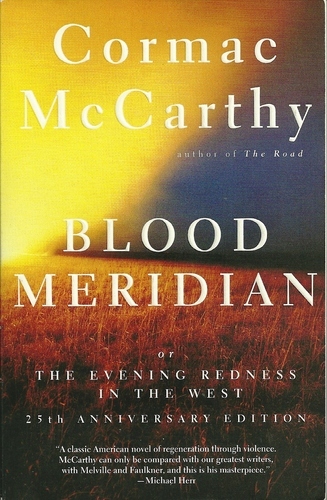 Blood Meridian is a book that treats violence as a commonplace occurrence, and offers little respite in its continual assault on all (or anything, please anything) that is good in the world. The prose is stark, direct, and often undefinable (perhaps somewhere, but I often found words for which no definition can be found). The novel immerses you in a world of evil and violence far more terrifying than any post-apocalyptic book can create. 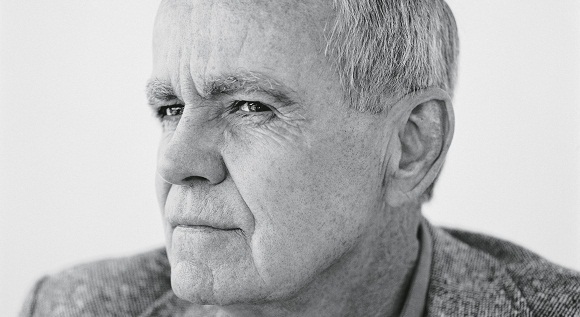 And this, indeed, is how I came to this “masterwork” by Cormac McCarthy (bio). I’ve read a few of his novels, and consider “The Road” (blogged about here) one of my all time favorite novels. This novel centers around “the kid” in the 1850s as he travels from his home state of Tennessee and joins up with the Glanton Gang, a real-life group of killers (there are probably more appropriate terms, but I’m calling them what they are) led by John Joel Glanton. Hired by the Mexican government to fight off attacking Native Americans, they killed any Native American they could since they were paid by the scalp. Women, children, unarmed men — it makes no difference. Even non-Native Americans were not exempt for their depravity as all of humanity appears to be at their disposal. What makes McCarthy’s descriptions so unnerving is the calmness and detachment used in describing the killings. You can almost read through some of them before the horror of what is happening dawns on you. I’m reminded of Tim O’Brien’s writing about the My Lai massacre during the American war in Vietnam. In the Lake of the Woods is a novel about a politician later found to have been involved in the massacre. But the most disturbing part of the book is not the fiction, but a chapter of excerpts from the actual court-martial records. What you see is this same dispassionate account of brutal abuse and killing. As if the event itself is not horrific enough, the presenting of it as a normal occurrence makes it even worse. dramatic category, but its power is clear. Under a gibbous moon horse and rider spanceled to their shadows on the snowblue ground and in each flare of lightning as the storm advanced those selfsame forms rearing with a terrible redundancy behind them like some third aspect of their presence hammered out black and wild upon the naked grounds. They rode on. The phrase, “they rode on,” is the perfect balance to that long, intricate preceding sentence. Language like his can be hard to follow in our quick read society, but a slow and thoughtful read pays off. Plus, he reminds you of the beauty of words (and perhaps I just tipped into the over-dramatic category). While “the kid” is the anti-hero of this anti-western, it is the Judge who stands out as the most memorable character. A large, hairless, white man, he is often naked and always calm. He appears to be waiting for others as they come to him, and his intellect puts him ahead of both enemies and his fellow travelers. He makes observations in his notebook in order to understand and thus control the world, and is given to long, fascinating discourses on a variety of topics. He is both God-like and devil-like, omniscient and monstrous, and terrifying in his outreach. Toward the end of the book “the kid” faces off with judge, the culmination of a relationship in which they dance around one another throughout the book. The judge smiled. He spoke softly into the dim mud cubicle. You came forward, he said, to take part in a work. But you were a witness against yourself. You sat in judgement on your own deeds. You put your own allowances before the judgments of history and you broke with the body of which you were pledge a part and poisoned it in all its enterprise. Hear me, man. I spoke in the desert for you and you only and you turned a deaf ear to me. If war is not holy man is nothing but antic clay. Clearly, this is a disturbing novel. The fact that McCarthy bases this on historical occurrences does not allow us to write this off as some post-apocalyptic fantasy. Instead, we have to face the judge and his comments about our own culpability in human affairs. You can find meanness in the least of creatures, but when God made man the devil was at his elbow.